The Georgini Manhattan features a large blue pendant stone that has been cushion cut to the highest standard. With faces that have been soft cut either side of the stone and surrounded by tiny white stones within the clasps and the sides, the result is a gorgeous deep blue stone full of reflection, sparkle and dazzle! The Georgini Manhattan is a beautiful ladies blue stone necklace finished to the highest quality standard and if you are a lover of blue, this is the perfect necklace for you. The stone is stunning, featuring a cushion cut that creates a smooth edged finished in a square shape with soft round corners. This is the same technique that is used to cut the highest quality vintage style diamonds. With a blaze of sparkling white cz stones surround the large main deep blue stone, the result is a very special blue pendant. This beautiful dark blue stone sits in a pendant that is approximately 20mm wide at the largest width, with four clasps and sides set with tiny white cz stones. 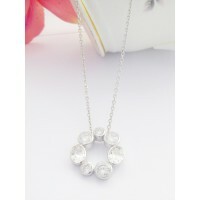 Set in highly polished sterling silver, the pendant is exquisite. 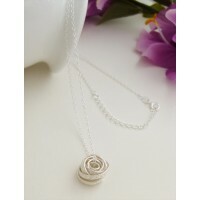 The chain is approximately 44cm long and is hallmarked 925 sterling silver with the Georgini brand name and also has a 5cm extender. The Georgini Manhattan features a large blue cushion cut stone backed in 925 sterling silver. The main pendant is approximately 20mm square featuring a deep dark blue stone that has been cut on either side. 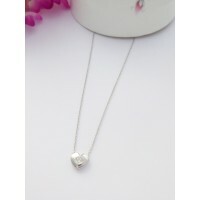 The necklace chain is 44cm long with a 5cm extender, it is 925 hallmarked sterling silver and is Georgini branded.